I pass by the Koryo Garlic Potato stall at the SM City North Sky Garden often and it's always packed with people. It made me really curious and I planned a number of times to try it. I finally got the chance to try the product tonight. I believe the Garlic Potato comes in one size only, a mini tub. 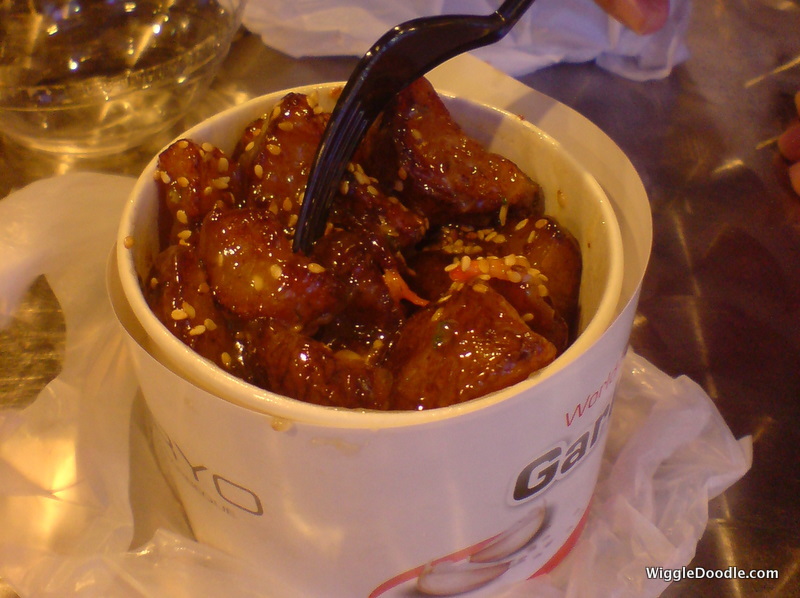 The diced potato is deep fried and then slathered in Korean barbecue sauce. As a final touch, it is topped with some sesame seeds. The resulting products is sweet with a little spicy taste and yes, garlicky. The garlic flavor isn't overpowering and gives the potato a good punch. I think it will go well with a can Coke. However, I will not buy from the stall because they sell it for PhP40 per can. If that is not overpriced, consider buying a small bottle of water from them at PhP30 each. This is even the SM branded bottled water which usually sells at PhP20 in the food court. Without the over-priced soda and water, I still enjoyed the Garlic Potato because it is a tasty snack. The mini tub size is good for one person. But if you do not each that much, you can share it with a friend. I will go back and have another go for this. But I will definitely bring my own soda. Yes, it is nice. Sweet, salty and garlicky in one bite. Unfortunately, I do not have information where Koryo went. The least they could do was post a sign informing their clients what happened to them and where they moved.